A spice native to south India and Sri Lanka, cardamom is beautifully aromatic and a mainstay in the regions' rice dishes, curries and chai tea. There are two main types of cardamom - green and black - both of the ginger family. If a cardamom recipe calls for just plain "cardamom", it means green cardamom. Black cardamom has a distinctly smokier aroma and is more suited for savoury dishes. Cardamom's diversity is matched by its potency: one cardamom pod holds about 12 black seeds, of which you need only a few to season a dish. This is a good thing because cardamom is one of the most expensive spices you can buy, second only to saffron. But like saffron, it can transform many ordinary dishes into something out of this world. 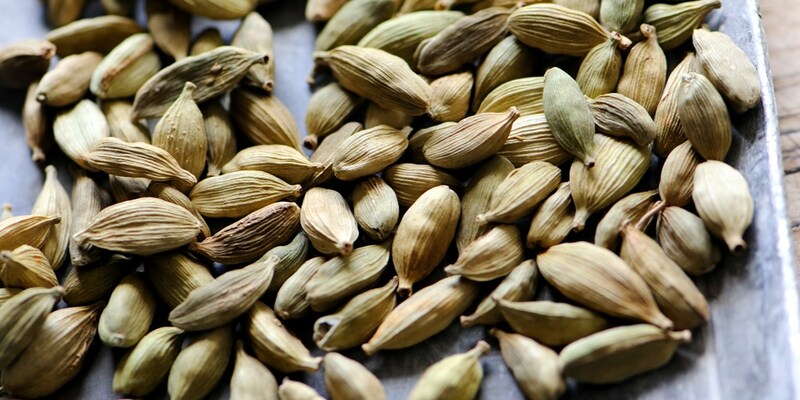 Cardamom's pungent, warm aroma works well in both sweet and savoury dishes, but it needs to be paired with substantial ingredients that can stand up to its intense fragrance. Rice is a perfect example, and when joined with cinnamon and cloves as in Alfred Prasad's rice pulao recipe, you achieve a perfect synergy that is all at once warm, deep and satisfying. Being of Indian origin, cardamom works well with other Indian spices such as cumin and ginger, particularly in rich meaty dishes such as lamb shanks. On the sweet side, cardamom is wonderful in rich, creamy puddings, particularly alongside stone fruits. A good example is Vineet Bhatia's grilled peaches recipe, where peaches are grilled with fennel and cardamom, then served alongside creamy cardamom-infused panna cotta.